Imagine grandmother's bountiful flower garden in mid-spring. Now imagine it again, but put it indoors, add Star Trek-level technology and turn those daffodils into cannabis plants. Justin Clapick and Travis Busack are the founders of Deschutes Growery in Bend. They're the current tenders to grandmother's "special" garden, growing cannabis professionally since 2010. Part farmers, part geneticists, part electricians, part carpenters, the duo has most recently added "sustainability ambassadors" to their resumes. Sustainability has become an essential theme for Deschutes Growery—something not done just once, but as an ongoing practice. "This is cannabis done differently," says Busack. Deschutes Growery's 8,000-square-foot facility has recently undergone substantial changes—positive changes. It's an evolution which will not only improve product quality and profit, but also the environment. Phase one of this evolution included state-of-the-art LED lighting and solar panels installed on the roof of the building. "When we're talking about energy usage, it's mind boggling how much is wasted with use of inefficient lighting. We now know there's a different approach, a more responsible one," said Clapick. Clapick and Busack made the environmentally conscious decision to replace their high-pressure sodium lighting, the commonly used light source in the cannabis industry, with a far more efficient LED system. In 2016, they also became Oregon's first solar-powered indoor cultivation facility. This first wave of changes in their new approach has already made an impact of $21,072 in electric bill savings annually. Opportunities for sustainable practices are plentiful in the cannabis industry. Cultivation of cannabis, especially indoor growing, requires a tremendous amount of energy. The major factors are light, energy, water and the subtle but constant factor of heating and cooling. As a business, Deschutes Growery has put an admirable amount of thought, effort and money into tackling these sustainability issues. "We're eliminating waste and we're doing it in a lot of different ways," said Clapick. The initial costs for lessening the environmental impact can be severe for businesses in the cannabis industry. Solar panels, LED lighting, intense HVAC equipment for climate control and computers to make it all play nice together are not cheap. A huge component of the progress being made must be credited to Energy Trust of Oregon. The independent, nonprofit organization has a mission of providing information, offering cash incentives and supporting customers with technical assistance in order to save energy and generate renewable power. Energy Trust offers its services and assistance not only to the cannabis industry, but across a wide range of industries, transforming over 660,000 homes and commercial spaces since 2002. 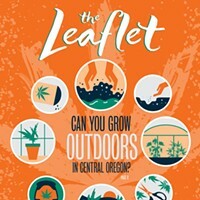 "In the Bend area, Deschutes Growery is an example of one customer with whom we've worked. Others include Worthy Brewing and Central Oregon Community College," notes Becky Engel, senior communications manager at Energy Trust. Without Energy Trust, important strides toward sustainability might be too financially daunting for the average company. 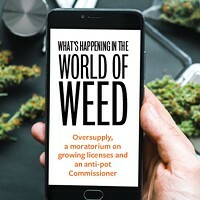 Clapick and Busack are very open about their goal of being the poster children of sustainability within the cannabis industry. They also want to share the info with others in the cannabis industry. "What would the point be, by being the most sustainable company in cannabis, if we want to restrict everyone else from being as sustainable?" said Busack. The word is getting out. Taylor Gorman, of Certified Portland Cannabis Cultivators, says he, too, recognizes the significance and power of responsible cannabis cultivation. While the growers at Certified Portland are already conscious of their environmental footprint, the company looks forward to continuing this evolution process on a larger scale. Hearing Clapick describe the nuances of his newly installed equipment highlights his diligence. In one room, he explains the complicated HVAC system, sucking out old air and filtering in fresh air, while maintaining the exact humidity to encourage healthy crops. In the next room, he breaks the LED lighting spectrum down to the precise micromole required by the flowering cannabis plants. Watering by hand allows for zero water waste in the facility. Solar panels provide renewable energy to power their newly upgraded equipment. The team also avoids using chemical fertilizers and pesticides, opting for natural soil nutrients and implementing what Busack refers to as "bio-warfare," using tiny helpful mites to combat other potentially harmful critters. Energy Trust began offering cash incentives and technical services to licensed medical cannabis growers in May 2013, and have since extended their services to cover the non-medical segment of the cannabis market. Engel hints that interest in energy efficiency could be on the rise as the cannabis market becomes more competitive. These valuable changes will allow growers to control costs and reduce their impact on the environment. "In 2016, Energy Trust provided incentives for lighting systems to 15 cannabis indoor grow facilities, resulting in close to 1 million kWh total annual savings," said Engel.